Gold fever is back! Italian designers Dolce & Gabbana have moved on in their pursuit of Gold. 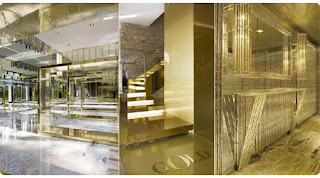 Following the Gold Motorola they have now hit the jackpot with this latest venture – Gold Restaurant, on Via Poerio in Milan. The duo has opened a new glitzy-ritzy restaurant with an entirely gold interior (not real gold to be exact). The 202-seat boite, just behind their Metropol show space, sports a first-floor gourmet restaurant, a ground-floor casual bistro and a small food shop that carries items from Gold’s traditional Mediterranean menu. Everything, from the stairs to the luminaries gleams in sparkling yellow hue. The designers, always image conscious, also commissioned a "healthy" menu with lighter options. The restaurant celebrity list boasts of the likes of Kylie Minogue and Paris Hilton.